John and I have been in our house for 4.5 years. This is our fourth summer in this house and we just got a grill this past week. Can you believe it?! I can't. Growing up my dad grilled year round. I have distinct memories of him out grilling in the snow- nothing held him back. And yet getting a grill here just never happened! That first summer we passed because we had so many big expenses in the new house, and then before you know it we were just used to life without one. In the past week I've cooked on the grill twice and I seriously don't know how I lived without it. Prepare to see many grill-friendly meals coming your way! These skewers were part of the Father's Day BBQ we had (hence the less than stellar picture- I was rushing to feed a crowd). I hate making green salad for parties because I feel like it never gets eaten. 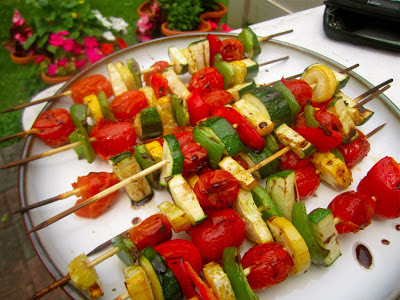 I decided to make these skewers so there were fresh veggies but in a more appealing way. Give this a shot- it's truly so easy and so delicious! 1- Assemble veggies on skewers. If using wooden skewers be sure to soak them at least 10 minutes in cold water prior to assembling to prevent them from burning. 2- In a small dish coming the olive oil, Italian seasonings, and rosemary. 3- Using a basting brush brush the oil over the veggies. 4- Grill until all veggies are softened and cooked. 5- Meanwhile, combine the balsamic, olive oil, lemon, and Italian seasonings. Once the skewers are cooked, drizzle the dressing over top. Serve the extra dressing on the side for those who want more. These look great! We love to grill - and the little dude likes things on sticks...(he thinks it's candy, probably).